Have I inspired you yet with all my posts on the cards I have designed over the years? I hope so. I know my friends and family love receiving my cards. If you are going to design your own card I urge you to get started now. Once Thanksgiving rolls around supplies will be hard to find and time will become even more precious. If you don't have time this year, consider this your year for collecting ideas. 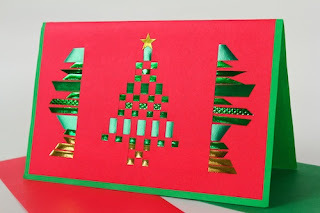 Save the cards you love, buy craft supplies on sale, get ready for Christmas 2012! 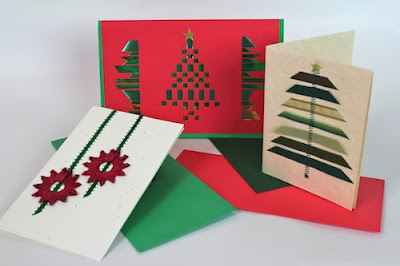 Today I'll share three-designs that fall into the mixed media category. I used things other than paper to create these. Ribbon is always a favorite of mine. All three of these designs use ribbon in different ways. In my first card today I have combined woven straw wreaths with a green ribbon. Here is one design that isn't a tree! The straw wreaths come from a woven garland I got a Ten Thousand Villages years ago. I sliced it into individual circles and glued them on top of the green ribbon. I purchased a flecked paper for the background of this card. 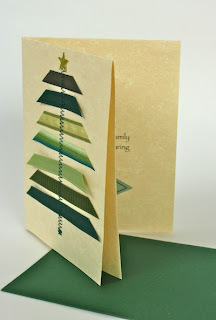 This design is another of my favorites and it was inspired by a ribbon tree I had seen before. I carefully cut slits in the card and then wove strips of ribbon in various metallic shades of green and gold between them. I left the edges exposed and cut them in a random pattern. The entire design was topped off with a classic gold star. I always keep those in my supply drawer. Most years they get used in the card in some way. For years I have wanted to combine sewing with my card design. I have a plethora of ideas but, remember I must make 70 of each design, so the idea has to be quick to implement. This one in 2009 was. 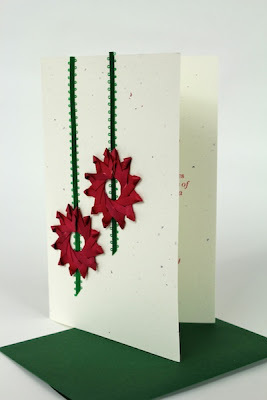 I used slightly tacky drafting tape to attach ribbons of varying greens and lengths to the front of the card and then sewed them right to the paper with a zig zag stitch. I then peeled off the temporary holding tape. If you peek around the corner to the interior you'll see the corner of a little green diamond. That was inserted to cover an error. I printed and made all the cards when I realized I had noted 2010 on the inside. (I had started putting the year on every card design to help the collectors.) I often make this mistake because, at the time I am creating the card, I am also thinking about and planning for the new year. I regularly (and absentmindedly) date the card for the following year. Didn't catch my mistake until a fix was required!